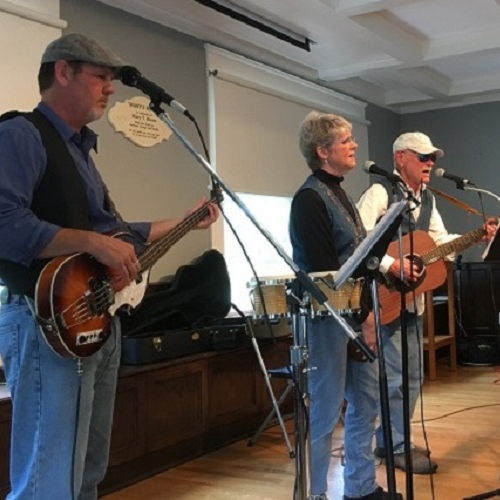 MyNorthTickets | Roy and the Blues Makers In: "The Song of the Wood Man"
Roy and the Blues Makers In: "The Song of the Wood Man"
The Song of the Wood Man is a totally original show - written exclusively by Allan James Grund - consisting of poetry, prose, comedy and music. Grund is recognized in Northeast Michigan as a poet, playwright, actor, singer/songwriter and musician. The Song of the Wood Man is a totally original show - written exclusively by Allan James Grund - consisting of poetry, prose, comedy and music. Grund is recognized in Northeast Michigan as a poet, playwright, actor, singer/songwriter and musician. He is also an award-winning short story author, the creator of nine CDs of original music, 10 books of poetry, prose and short stories, seven original works for the stage and numerous concert shows. Allan James Grund (As Roy Hickok) Lead Singer/Songwriter. Rhythm Guitar and Harmonica. Sue Floer (As Ethel J. McKinley): Vocal Harmony. Flute. Bongo Drums. Ukulele. Rhythm Instruments. Jeff Powers (As Reverend Jimmie Hawks): Vocals. Bass. Acoustic Guitar. Mandolin. Accordion. Keyboard.